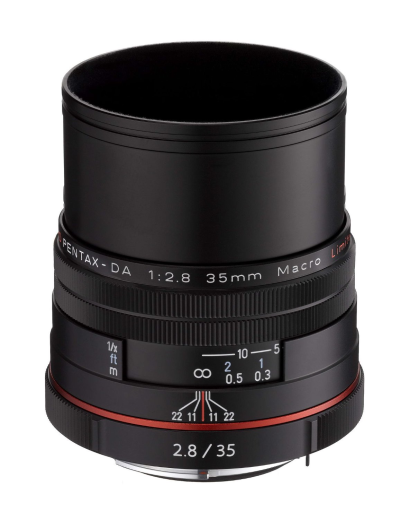 The Pentax 35mm f2.8 Macro DA Limited Lens Black features an equivalent focal range of 53.5mm on a 35mm film camera and offers a natural perspective similar to that of the human eye, making it versatile enough to be used with a wide range of subjects and applications. This lens is ideal for capturing close-up macro work (minimum focusing distance 0.139m) and shooting handheld at sunset, dusk, gigs and indoors, thanks to its fast f2.8 maximum aperture. The High Definition (HD) coating provides higher light transmission to ensure sharp and flare-free images, whilst the round-shaped diaphragm produces a natural, beautiful bokeh (out-of-focus) effect making it a superb lens for portraits. The Pentax Limited series lenses are renowned for their hand-machined, well-built aluminium body, outstanding image quality, HD coating and a round-shaped diaphragm for a beautiful out-of-focus effect. This lens is designed to fit digital SLRs with a Pentax K-mount. THIS IS A SPECIAL ORDER ITEM. PLEASE ALLOW 5-7 WORKING DAYS FOR DELIVERY. TO CHECK DELIVERY TIMES OR IF YOU HAVE ANY OTHER QUESTIONS PLEASE DON'T HESITATE TO CONTACT US.